SmartDeco exhibited at Spring Fair International 2014 in Birmingham, where all kinds of retailers – department store chains, boutiques, gift shops, distributors and agents from all around the UK and the world come to meet suppliers and manufacturers. SmartDeco’s Life’s a Beach’ Deckchair and Seaside Lampshade by British designer Jacqueline Hammond, were chosen for the Product Showcase in the entrance to Hall 7 (Contemporary Home and Gifts) at Spring Fair International 2014. 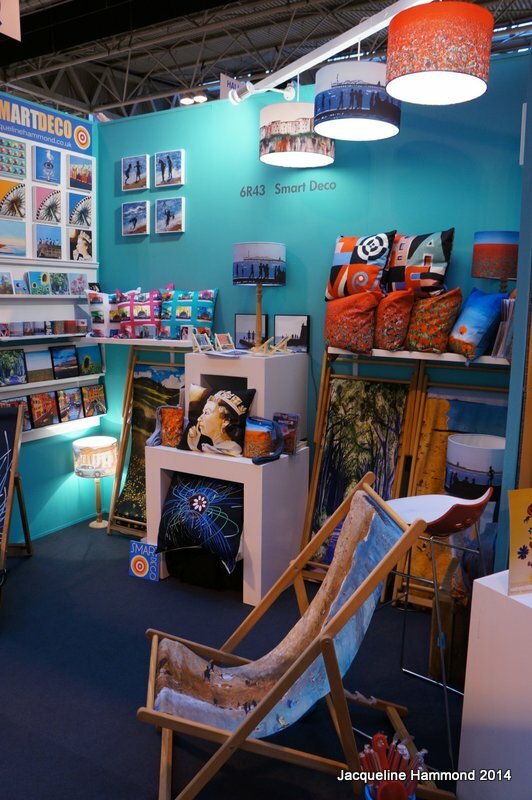 Spring Fair is “the largest trade exhibition in the UK and Europe’s biggest presentation of trend driven new products” so it was fantastic to have my designs featured in such a prominent position, great to know that every visitor coming into Hall 6 and 7 would have seen the deckchair. Although I’m not sure it was so easy to find the Smart Deco stand at Spring Fair! It is a vast show and we were tucked away rather than on a corner like last year, so if you were at Spring Fair and were looking for that beach deckchair you saw on the way in we were here on Stand 6R43! This entry was posted in Business, Exhibited, Smart Deco Collection and tagged Art, artist, beach deckchair, contemporary, designer, exhibition, exhibitor, Gift fair, gifts, Home Accessories, homeware, interior designer, interiors, retail, retailers, shopping, shops, spring, Spring Fair, Spring Fair international, Trend. Bookmark the permalink.